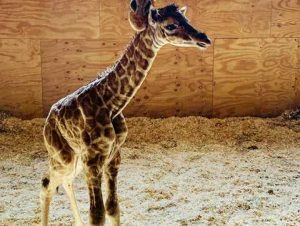 This morning, I watched April the giraffe give birth to her fifth calf along with 300,000 other people glued to the live webcam at Animal Adventure Park in New York. I’m a sucker for anything ‘baby’ … giraffe or puppy, duckling or human! Watching the miracle of birth is also something that will enrapture me anytime. ‘Tis the season for babies, birth and blossoms. Spring is also a season of TRANSFORMATION. As the sun comes out, the birds start singing, the flowers bloom, and the calves are born, we, too, are internally driven to grow and change, to re-awaken and transform. There is a desire to blossom – not just shift, but be bigger, bolder, more awake and alive. I say…. “LET’S DO IT” ! Here are 5 Tips – 5 Elements of Transformation that will set the stage for lasting growth and change and simple practices to realize each element. Happy Spring! The universe is waiting to support you and the first step is making a commitment to yourself – your dreams, your goals, your growth. Buy a journal – one especially for this journey. There are some beautiful journals available on Amazon and Etsy. Locally, you can find some blank journals/ sketchbooks at Copperfields and Fine Lines Art Supply. Brainstorm all that you want to create for yourself – what are you driven to do, have, be? In the spirit of transformation, I am committed to …. I am committed to manifesting …..
My commitment to myself this Spring is to …. Once you commit to your own transformation, a healthy dose of nurturing and self-care is essential. Flowers do not blossom without water. Bumblebees need nectar to flourish. Tender care is essential for the growth of a newborn. Dreams do not manifest without attention. Healthy food, plenty of water, deep sleep, daily movement, many hugs, and an abundance of encouragement is necessary for continual growth. This aspect of transformation is often the hardest for most people. Taking time to nurture yourself is often challenging. It always seems easier to feed the kids, fill up their water bottles, water the flowers and offer a hug to a friend than it is to pay attention to your own needs. Sometimes you don’t even know your own needs. Take time to explore your needs and nurture yourself this Spring. Help yourself blossom and grow so that your dreams may be realized on the foundation of a strong and healthy YOU. Assess your current self-care practices – what are your strengths and where do you need to change ? Here is a self-care quiz to help you get started. Commit to at least one self-care action each week. Share your commitment with your friend/family and ask for support and encouragement! Transformation takes time. You may not see visible changes right away. Don’t hurry the process. Notice the small successes. Nurture yourself. Breathe. Be gentle with yourself. Keep moving forward. Be patient. Let us obey the eternal rhythm and be patient with our own transformation. Allow your own wings to unfold gently, then you will fly. Buy a 50-piece puzzle. Choose a design that you love that inspires you. Put the puzzle together ONE PIECE A DAY. Do not cheat. As you watch your beautiful image unfold, notice your own blossoming, your own transformation manifesting. I took this photo three years ago while hiking in Sonoma at the beginning of Spring. 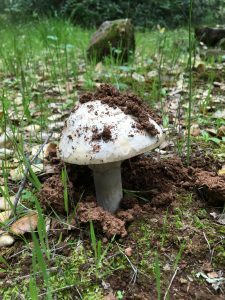 I was so thrilled to see this little mushroom had pushed its way up through the soil. I love this reminder of the perseverance it takes to get where we are going. Transformation is not easy. It requires work. Sometimes we are up against a whole pile of dirt and other times it is smooth sailing. Let this little mushroom remind you that you can do it! Reflect upon all of the times you have persevered when the ‘going got tough’ – when the odds were against you. Write down in your journal all of the ways that you have persevered over time. Take a photo, draw, paint or write a piece of music that represents your own perseverance as a reminder of your resiliency, commitment and courage. When we get to our destination, it is time to celebrate and most importantly, experience the gratitude for ourselves and anyone who helped us along the way. Gratitude is contagious and as research has shown, this simple experience can lead to profound benefits in all areas of our lives. 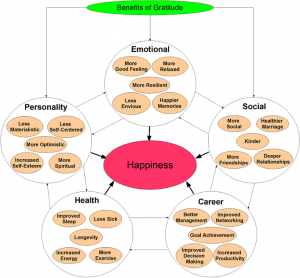 Check out this diagram of the Benefits of Gratitude based on more than than 40 research studies on gratitude. Seriously? Who wouldn’t want all of those delightful benefits? If you want a year of transformation, how about infusing your life with gratitude and see if you too feel these blessings! Write a gratitude list daily, weekly or monthly. There are a number of gratitude journals and exercises available on the internet. You can even create a gratitude jar for yourself and/or with your family! 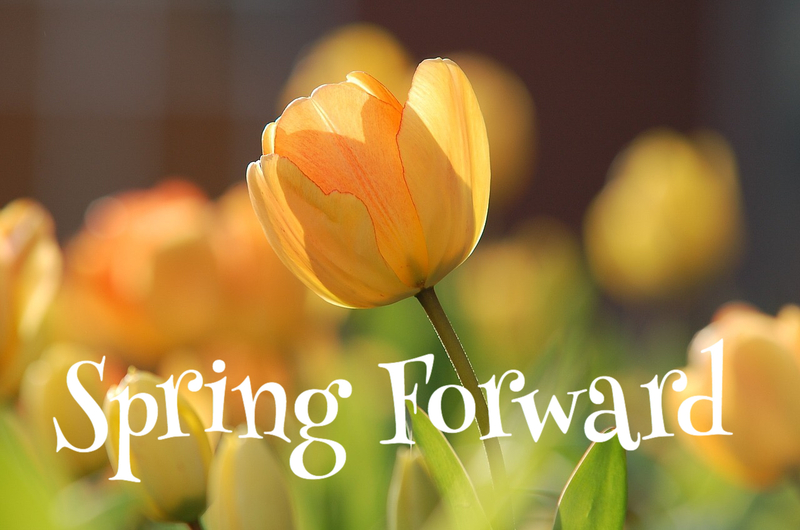 Spring Into Your Life ~ Make a commitment to your transformation, nurture your whole being, be patient, persevere when life presents obstacles, and be grateful for your blessings. Please follow my Facebook page and Instagram page and if you aren’t already, please sign up for my newsletter! Happy Spring!